Not-For-Profit Public Performance Rights. Comprehensive lesson plans to integrate in the classroom, including small group instruction, class discussion, assessments and other activities. Prepared by TRASHED Producer and former teacher Bill Kirkos. If you are interested in screening rights for TRASHED but are not affiliated with a school, please use the contact tab to contact OXI Productions directly for more information. 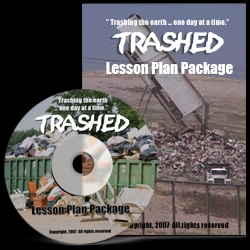 ATTN: TRASHED Lesson Plan pkg. Please complete the form below to request additional information before purchasing.